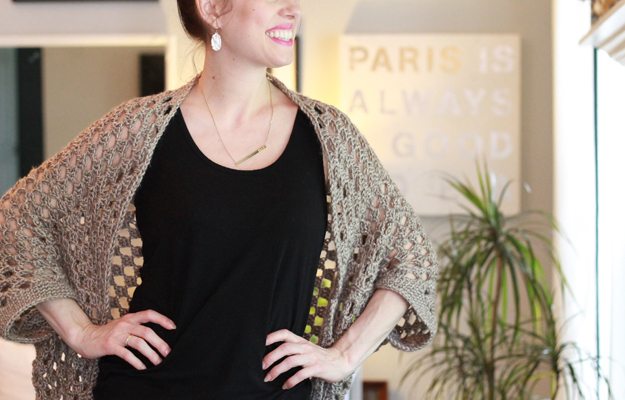 The Dapper Bun: Cocoon Sweater + Something Neat! Cocoon Sweater + Something Neat! Greetings, greetings, and Happy Monday! I'm super excited to share something I've been thinking on for a while and that is my new crochet Instagram account (here, or look for username granvillestitchery). After a ten year hiatus from crocheting, I picked it up again a couple of years ago and have been practicing, practicing, practicing! I originally only learned a few basic stitches (this was before YouTube, Blogger, etc. and many internet resources become popular) and never thought I would be able to crochet more than rows and rows of these basics. When I picked it up again, it had to reteach myself and it was a lot easier the second time around. Once I tackled this challenging scarf last Fall, I figured it was time to try more advanced works (like these vintage doilies)! After thousands of yards of yarn and thread running through my fingers, I'm ready to share my work online - a kind of scary thing, but I'm going for it anyway. As for this cozy sweater, I crocheted it from a fabulously easy pattern made by the talented Kelly at Knitbrooks. It worked up quickly and I ended up making a second this week - though by now, it's a bit too warm in Atlanta to wear them so they will be stored for next Fall (when I'll probably make a few more in other colors). Thank you so much for stopping by and I hope to see you on IG! One more note - today should have been Bandit's 8th birthday! What type of yarn did you use for the shrug? You did a great job...it looks wonderful!